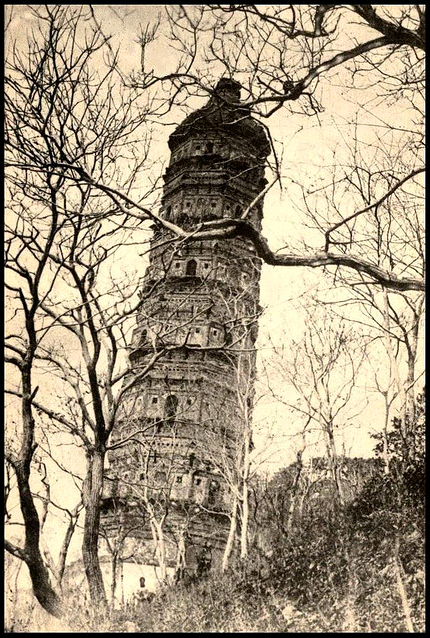 Unlabeled and undated image from a vintage Chinese postcard. I quite like this explanation because when you teach the martial arts, you do become aware that some techniques and styles rely more on the principal of leverage than others. This explanation seems to have some value in actually explaining physical observations. But I am also quite sure this is not what the discussion was originally about. 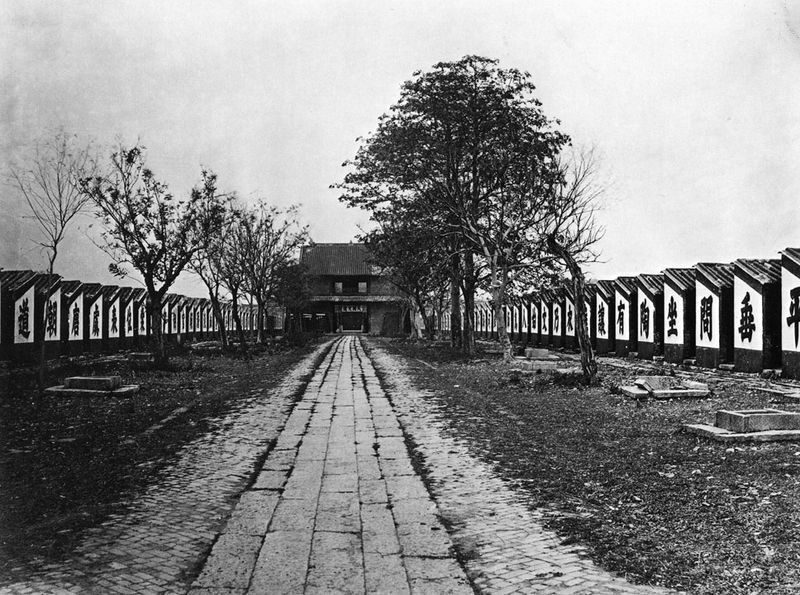 A group of cells where the civil service exam was administered in Guangzhou. The photo dates to the mid 1870s. It seems unlikely that the guys in Hung Gar or Choy Li Fut spend a lot of time dealing with this. I don’t have a lot of experience in those arts, but from my limited interactions with local Hung Gar practitioners they seem to wear their “hard conditioning” on their sleeves. Still, for other southern arts this could be a major problem. Are White Crane, Pakmei or Southern Mantis “internal” arts? Speaking more broadly, can any martial art that originated in Southern China really be considered an “internal” martial art? Shen Yiguan, Huang Zongxi and the Literary Creation of the Internal Arts (Neijia). On both historical and sociological grounds I would have to argue no. It is high time that we, both as academics and practical students, started to develop a typology of the Chinese martial arts that does a little more descriptive and theoretical work for us. At best the “internal vs. external” divide replicates and misapplies an old political debate (and later a specific philosophical theory) that really have very little to do with the southern approaches to hand combat. In fact, this set of labels is not very helpful in understanding the vast majority of China’s historic and modern hand combat traditions. This does not mean that martial artists in the south are not sensitive to “soft” energy or understand the concept of “relaxation.” They certainly do. In fact, there was a whole (somewhat esoteric) discussion of “cotton boxing” that took place in the region in the late 19th century. So we know that these ideas were being discussed and taught in the 1800s. These same concepts are still central to Wing Chun and a number of other regional arts today. But when we start to misapply these terms from the north, classifying all of this as “neijia,” we fundamentally misunderstand what was a unique regional conversation. It might be very interesting to conduct a comparative case study where these local ideas about softness and relaxation are compared and contrasted with “neijia” philosophy of Sun Lutang. Yet to do that we must first acknowledging that we have two distinct sets of observations. If we simply collapse the conceptual distance between these two, then we have nothing left to compare. There can be no meaningful dialogue. Once again, we have “explained” the southern martial arts by simply explaining them away. This sort of linguistic and cultural imperialism is often seen in casual discussions of martial arts history, yet it is not a view that we as a field should accept or promote lightly. The vocabulary that we have inherited from practitioners is not simply “dojo-speak,” innocent, unsophisticated and of inscrutable origins. Instead our terminology tends to emerge from political or economic competition. Far from being neutral, the debate over “internal vs. external” martial arts subtly reinforce power hierarchies that we might find troubling if we were consciously aware of them. Marnix Wells and Stanley Henning tackled the origins and evolution of this typology in an article titled “Boxer Zhang Songxi and the Origins of the Internal-external School Concept.” (Journal of the Asian Martial Arts. Vol. 20 Num. 2. 2011. pp.22-29.) Their article is very valuable on a number of fronts, not least of which is the speed and ease with which they demystify what has been for many people a very thorny problem. I would even go so far as to say that this is one of the better, solidly academic, articles that JAMA has run in the last couple of years. The origin of the typology that Wells and Henning outline proceeds as follows. In the Ming dynasty there was a locally well know martial artist by the name of Zhang Songxi. We don’t know a lot about this individual or his career, but given that we know practically nothing about most civilian martial artists from the period, he has become a figure of interest for Chinese martial historians. Much of what we now know about Zhang Songxi was recorded, and perhaps reconstructed, by Shen Yiguan (1531-1616). Shen was a member of the imperial court and a grand-secretary to the Emperor near the end of Ming dynasty. His essay Biography of Boxer Zhang Songxi is unique for its subject matter. Generally civilian martial artists only command this level of imperial attention when they were being executed for some variety of treason. The fact that Shen Yiguan felt comfortable writing on such an un-Confucian subject at all probably has a lot to do with the increased interest in martial skill and valor that developed as the military situation of the government deteriorated. There is a lot of interesting information in Shen Yiguan’s biography of Zhang Songxi. Hopefully I will have a chance to write about it in greater depth in my next post. But for our current purposes the two most interesting things to note are that Shen Yiguan’s choice of subject was probably a response to the wider political atmosphere, and that nowhere in this biography does he ever mention the “internal vs. external” concept or characterize Zhang as an “internal” boxer. This is very important as a later historian, writing at the start of the Qing dynasty, would go on to claim, for his own political reasons, that in fact Zhang Songxi was the archetype of the “internal” boxer. This later scholar and historian was Huang Zhongxi (1610-1695). He was a Ming loyalist and, unlike the vast majority of scholars of his generation, never managed to reconcile himself with the new foreign dynasty. While writing about the good old days before the fall of the Ming dynasty he composed an epitaph in which he characterized Zhang Songxi as a practitioner of the “internal” schools of the martial arts, different from and superior to “external” schools, like Shaolin. Given that this was the first time that the idea of “neijia” appears in the written record, what exactly did Huang Zongxi mean by this? According to Wells and Henning, his meaning was a lot more literal than one might think. The fighting techniques of Shaolin were “external” because Buddhism was a foreign religion. The Qing were also of foreign origins, and criticizing the one (which had failed to preserve the Ming) was a good way to make a dig at the other. The arts of Zhang Songxi were “internal” precisely because they originated within the Ming state and the Han ethnicity. Sure they may not have been as strong in the base military sense, but they are more sophisticated, and will win out in the end…..
Huang’s statements do not really have anything to do with boxing on a technical level. Nor was he attempting to describe a philosophy of the martial arts. This was purely a conversation about political aspirations. I think this is precisely why students have such a hard time figuring out what “internal” and “external” mean today. It is also why a certain class of martial arts writers and school owners love the distinction. The political conflict that gave rise to the term, and the sorts of political and ethnic hatreds that reinforced it, don’t really exist today. There is nothing real for these terms to attach themselves to, and so it is easy for those who are creating martial styles to attach them to anything that they want to promote. Using the term in his way is fine when discussing his literary works or the martial practices that they correspond to. But exporting these terms to other styles and other regions of the country is sure to cause more confusion than clarity. This discussion can’t mean much at all when applied to the unique martial traditions of Southern China. Of course all of this begs an important question. In the social sciences we don’t discard a theory until we have created a better one to take its place. If we toss out the old typology of internal vs. external, how should we classify the martial arts? Do we need different sorts of classifications for different regions of the China? I would hesitate to say that it is impossible to create a system of national, or even international classifications. But I will state emphatically that in my own research, regional typologies have proved to be much more helpful. 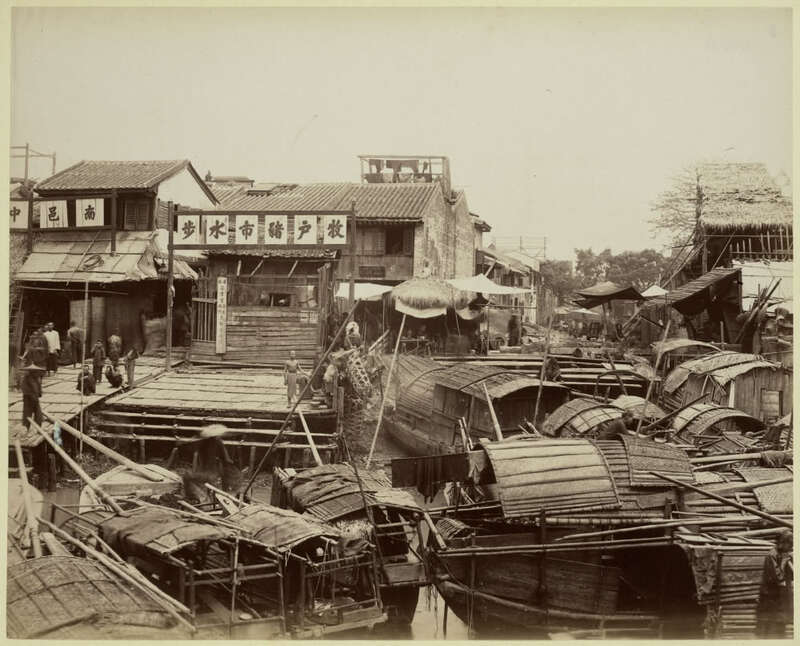 Much of my recent writing has focused on the martial heritage of the Pearl River Delta and Guangdong. When writing about this region I have tended to classify hand combat schools as being either “Hung Mun” or “Hakka” styles. The Hung Mun styles were practiced by ethnically Han, Cantonese speaking, individuals. They tended to share similar creation stories (focusing on the Shaolin Temple) and other sociological markers between schools. The Hakka styles arose among the ethnically Han Hakka speaking minority. They also tended to share a number of traits and sociological markers. Nevertheless, every typology has its weaknesses. Changing historical circumstances tend to lead to the eventual obsolesce of any typology. The Hung Mun/Hakka distinction does a great job from the start of the Qing dynasty until the 1920s. However, by the 1920s so many Hakka teachers had moved to cities like Hong Kong, Guangzhou and Foshan, opening schools where they taught all comers, that the sociological significance of these terms was weakened. On a technical level the “Hakka” arts remain distinct and even identifiable. Yet something like Pakmei, which never existed outside of a modern commercial marketplace, might not actually belong in the same typology as the much older arts that were actually part of the Hakka-Punti civil war. In conclusion, we need to make sure that our typologies are actually doing descriptive and theoretical work for us, both as academic and practical students of the martial arts. This means that we need to be conscious of what our research question really is, and secondly, of the origin of the vocabulary that we employ. Paying attention to these two things will go a long way towards rationalizing our understanding of the Chinese martial arts. The next time a student asks me whether Wing Chun is an internal or an external martial art I am just going to say “no,” and explain that it is neither. Wow! Thanks a lot for this post! This is the second text i read here, and it always feels like the whole world is new to me!